If a customer disables auto top-up they will never be charged an overage fee even if they exceed their plan's data limit. Data will no longer be cut off 100 MB before the plan limit. Users will be able to use their full data allowance. Data was always supposed to be cut off before or at the plan limit, but FreedomPop's data reporting is often delayed by several hours. That meant it's possible to exceed the limit when using data quickly, such as when downloading a large file or watching streaming video. Until now, if auto top-up was off and a overage occured, FreedomPop would deduct 1.5¢, 2¢ or 2.5¢/MB (depending on the plan) from the customer's balance. If the balance reached zero, FreedomPop would charge the customer for a $5 top up, deduct the overage charge and add the remainder to the account's cash balance. To reduce the chance of unintended overages, FreedomPop would also cut off data 100 MB early for customers with auto pay off and balance under $2. Needless to say, charging customers who had disabled auto-tops and cutting off data before it was all used resulted in lots of customer complaints. 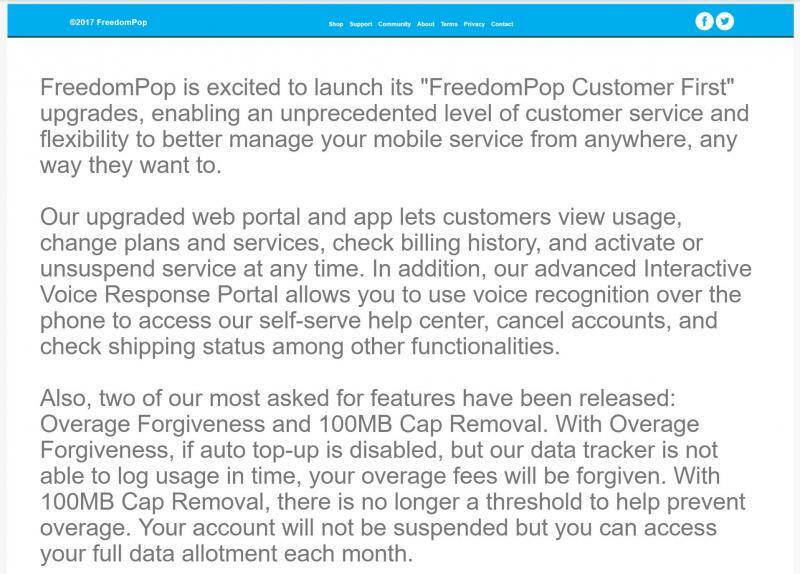 Effective immediately, FreedomPop says they will let customers use their full data allowance and will not charge any overage fees to customers with auto top-up turned off. Keep in mind that you need to have a $5 balance in your FreedomPop account in order to disable auto top-up. If you don't FreedomPop will charge your card $5 when you disable auto top-up. The $5 will be added to your account. In the past, account balances could be used to pay for overages. With the new no overage policy it looks like you have to turn on auto top-up in order to be use able to use your balance to pay for additional data. With auto top-up on your card gets charged $15 whenever your remaining data goes below 100 MB and your cash balance is under $2. The $15 gets added to your balance and you can keep on using data, and paying for it. According to today's announcement, FreedomPop also has a new Interactive Voice Response (IVR) portal that lets you call in and use voice commands to ancel or upgrade your account or check order shipping status.I tried calling FreedomPop at (888) 743-8107 to try the new IVR but it doesn't seem to be live yet. There is an interactive system in place but it prompts press for key presses like "Press 1 to cancel your service", rather than responding to voice commands. For more about FreedomPop including details of its free and paid service plans see our Prepaid Operator Profile: FreedomPop. I have the free plan with 700MB with the AT&T LTE sim card. I never enabled the top-up feature. What happens if I go over 700MB? I'm a bit confused. Isn't auto-top up enabled by default? @JSantana "With auto top-up on your card gets charged $15 whenever your remaining data goes below 100 MB and your cash balance is under $2. The $15 gets added to your balance and you can keep on using data, and paying for it." How do you have 700MB? I only get 200. Add 10 or more Freedom Friends. It's easy and takes less than 30 minutes. 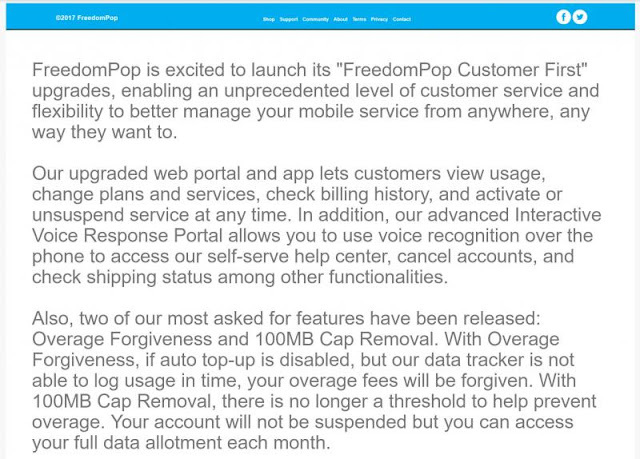 Instructions are in the FreedomPop profile linked to in the last paragraph. You didn't read the instructions. You don't add your real friends. You add strangers who post on a Slickdeals thread or Facebook page asking to be added. The adder and addie both get 50 MB per month so its a win, win. I'm no fan of FP, but I have nothing but positive things to say about this change. The "overage" shell game was one of the ways FP tricked people out of their money, and it looks like they have taken this away and have become, imagine that. more honest! A $10 balance is required to downgrade to the free plan and a $5 balance is required to disable auto top-up. If you downgrade first you will have a $10 balance and you won't have to pay more to disable auto top-up. Disable auto top up first and there is only a $5 charge. Now that you have a balance you can downgrade to the free plan for no additional charge. Can someone who has recently disabled top up for $5 confirm that there is no additional charge to downgrade. In my new account (1.5.18) there is no charge for disabling Auto-Top-up, which means the only way to downgrade is to pay $10. If you downgrade first, it is possible you would then have to pay $5 to disable auto top up. So you *might* end up paying $15 if you did it that way. I can't decide if this is a joke or if they really are trying to go "Customer First" or perhaps it's all lip service. They just can't seem to leave the confusion out of their plans. I know some are happy but I can't be more pleased that I'm over them. FreedomShark.... Where our customer is our chum. I was deep into FP for a while. Got multiple SIMs and put them into multiple low/mid cost phones I had accumulated over the years on Black Fridays. They were all clones software wise so it did not matter which one I used. I rotated them weekly. Used Hangouts and Google Voice for calls and text. It was actually kind of fun for a while and the $0 cost was nice. Eventually I got tired of the routine, cancelled all the FP lines, put the phones to other uses, and went more conventional with Project Fi. I don't think these changes will entice me to reconsider. Freedom Pop has a different customer base, they could do almost anything unscrupulous and get away with it because it's free. Jumping through fewer hoops in this case is good but I guess I'll believe it when I see it. Might just be a ploy to up their membership numbers. How long does credit in the account last? I thought they had added a fee of it goes unused for a year etc? Credit expires after 30 days but you can reactivate it for free. If you don't reactivate expired credit it goes away after 90 days. As long as you reactivate your credit at least every 90 days it lasts "forever (until FreedomPop changes the rules or goes out of business). Account credit lasts "forever" because it is basically unusable. No plan payments, such as rollover, will be taken out of account credit, so, as noted, the only way to use it is to turn auto-top-up back on, but only until you get to $2 left, which is then unusable unless you want to add more credit to your account. It's basically money that FP just holds for you until you lose it. Still, FP can offer a good value service as long as you understand it. Dennis, How about another FP update with all the "devilish details?" Everything I know about FreedomPop is in my Prepaid Operator Profile: FreedomPop. I wonder what instigated this change? Encouraged by this article, I decided to disable auto top-up on one of my Freedompop accounts, thinking it's just a one time fee - either $5 or $10. It turns out, I can do it only if I subscribe to a new $4.99/month service. No positive changes after all!
" You must have the FreedomPop Safety Mode service to disable Top Ups. " You are correct you now have to enable the $4.99 Safety Mode service to disable Auto Top-up. After you disabe Auto Top-Up you can disable Safety Mode so you only get a single $4.99 charge.